Many apologizes for being absent from the blog world this past week. Here are my excuses: I've been working on this, the man took the home computer away to grad school, and I've also been working on The Holiday Shops at Bryant Park blog. Pictures from the 2007 holiday shops season. I really, REALLY didn't want to say the "H" word until after Thanksgiving, but how could I not share Terrible Dollhouse with you ASAP? And the magical lotion of Nubian Heritage? It would just be wrong. Besides, we're very excited about our new vendors mixing it up this year with our fabulous vendors from years past. 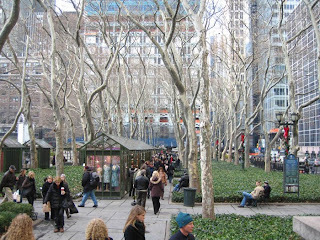 The Holiday Shops open in Bryant Park tomorrow, Saturday the 22nd. 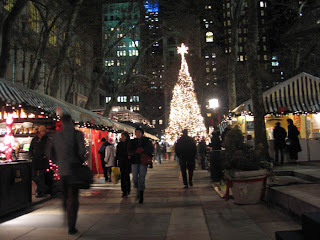 I hope you non-locals have a holiday trip planned to NYC this year and can visit Bryant Park, shop for the holidays and skate at our free skating rink (there is a fee for skate rental). If you're interested, please contact me and we'll talk about which shops you should visit. And if I can, I'll buy you some hot cocoa and we'll do a little shopping tour! Why am I doing all this? Go here to get my spiel and read our corporate goals and motto. Ha ha, just kidding! But really, sometimes I need to remind people what Fashion Herald is all about, or you guys will think I'm some kind of weird, crazed, 34th Street-obsessed shopper. Which actually is what this job has turned me into. Beware, Black Friday 34th Street shoppers! Unfortunately, I don't have any trips planned, so I won't be able to see any of this incredible wonderment. But I'm hoping you'll take pictures and post them so I can see anyway. Seriously, don't even think about apologizing for being crazed, it *is* your job and your passion and we love hearing about it and learning more about it. We are *very* impressed with your skills and what you do! I think I will be there in January. I hope I can shop with you when I am there. That would be FUN! I wish I could be there. mm it's too cold for me as well. I should plan it for warmer weather. I hope you'll post some pictures, since I just can't see it "in loco"
hey all, I update a blog for the holiday shops, many of whom have websites where you can get their product, so check out shop.bryantpark.org for vendors. And La Belette, unfortunately, the shops are out of the park in January, but I would love to go shopping with you! Sounds like you've been excitingly busy!! I wish we celebrated a Thanks Giving style holiday in Australia...Who doesn't love roast turkey! Are there vintage stores in Byant Park? I love those NYC pics at the top of the post! Hmmmm, I really miss NYC. I've only been twice, but it was super fabulous. Hi there-love your photos my dear!! Apart from London of course, New York would definitely be on my place to visit pre christmas!! Sigh, hope I can do some shopping in New York one day! But that being said I do love living in London lol. Terrible Dollhouse made me snicker. Love it! Dammit! I'll be in Chicago, but dreaming of the Terrible Dollhouse. Oh thank you so much for reminding me about Bryant Park iceskating. It's so much cheaper than Wollman Rink & Rockefeller. all the malls and shopping centers are X-mas-ish already. What a lovely Holiday Shop Blog project. I just went by the shops today and loved the beautiful displays. Will be reading that other blog!! !